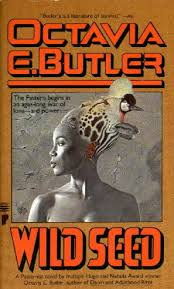 Wild Seed is that novel for many folks – when you ask an Octavia Butler enthusiast what their favorite text is, chances are this novel will be in the top three choices. There are multiple possibilities to consider about why this might be true, but what follows is an attempt to identify a few reasons I gravitate towards this prequel text in Butler’s Patternist series. 1. The protagonist – Anyanwu is certainly an uncanny Black female character who, among other supernatural powers, shape shifts – for fun, for protection, to learn about other animals. She is witty, intelligent, and generous, but also fiercely protective of her family and resistant to those who seek to control and commodify her. She is cool. 2. The genre – Much of Butler’s work defies traditional definitions of specific literary genres. Butler creates a unique text because Wild Seed crosses multiple generic borders: African American, American, Black feminist, Science Fiction, Historical, Speculative, etc. 3. Interlocking identities – My research examines US women of color feminisms and is primarily concerned with intersectionality, so Butler’s text is important to consider because she writes about what far too many (white and/or patriarchal) authors ignore or don’t consider: racial identity, sexuality and (hetero)sexism, gender norms and expectations, class locations, survivors and perpetrators of abuse, and enslaved people’s individual and collective experiences. 4. Resistance – Anyanwu lives for centuries, learning that her body is a site of resistance because she possesses extreme strength and can manipulate her appearance. By the end of the novel Anayanwu turns the tables on Doro, the antagonist, ending his physical and emotional control over her. Erin Ranft, a scholar of American and African American literature and Women's Studies, is a contributing writer for the Cultural Front.